Patient's who suffer from Zenker's Diverticulum report significant difficulty in swallowing, food regurgitation, aspiration, noisy swallowing, etc. These symptoms all stem from the abnormal presence of a "pouch" in the throat where food and liquids get trapped during swallow. 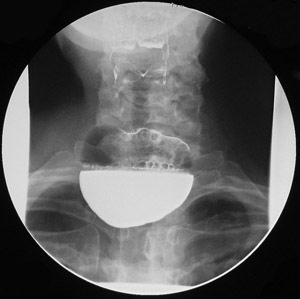 The main way of diagnosing a Zenker's Diverticulum is a radiological test called the barium swallow. Endoscopic staple diverticulostomy (ESD) is a minimally invasive procedure to eliminate the symptoms associated with Zenker's diverticulum without any incisions in the neck. Watch video below on how it is performed. Should a repeat barium swallow be performed after a successful ESD procedure, much confusion often occurs as the Zenker's Diverticulum can still be seen even if all the symptoms have disappeared. This is NORMAL. With the ESD procedure, the pouch is actually NOT removed. Rather, the common wall between the pouch or diverticulum and esophagus is divided preventing food and liquids from becoming trapped. As such, during a post-operative barium swallow test, one can see the barium liquid pooling in the remnant pouch (just like before ESD surgery) with some differences compared with pre-operative appearance. Barium may still appear to be "trapped" in the remnant pouch (albeit much smaller amount) because during the ESD procedure, a "V"-shaped cut is made in the common wall. 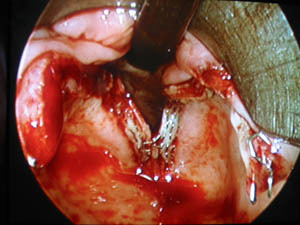 Towards the bottom of the "V" pointed cut, less than 1 cm of common wall is typically left still intact in order to minimize risk of esophageal perforation. This remnant common wall is why some barium may still appear to pool within the remnant pouch. What all this basically means is that the ESD procedure resolves the abnormal symptoms associated with the Zenker's Diverticulum without removing the pouch. Due to the persistent presence of the pouch, a repeat barium swallow after ESD, if performed, will reflect the presence of the remnant pouch. Currently, the recommendation is that there is no need to repeat the barium swallow unless there is a concern for perforation or there is a recurrence of symptoms. Normal fluoroscopic appearance status post-successful endoscopic Zenker diverticulotomy. Laryngoscope. 2017 Jan 4. doi: 10.1002/lary.26446. The radiological appearances after the endoscopic crico-pharyngeal myotomy: Dohlman's procedure. Clin Radiol. 1997 Aug;52(8):613-5. Long-term clinico-radiological assessment of endoscopic stapling of pharyngeal pouch: a series of cases. J Laryngol Otol. 2001 Jun;115(6):462-6. Pharyngeal pouch endoscopic stapling--are post-operative barium swallow radiographs of any value? J Laryngol Otol. 1999 Mar;113(3):233-6. Radiographic findings and complications after surgical or endoscopic repair of Zenker's diverticulum in 16 patients. AJR Am J Roentgenol. 2001 Nov;177(5):1067-71.